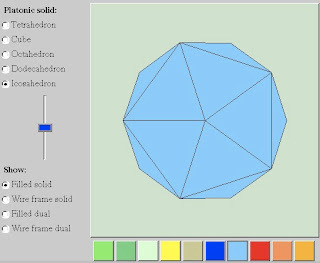 If you want to show your students what tetrahedrons, cubes, octahedrons, dodecahedrons and icosahedrons really look like, this "virtual platonic solids application" will be a great addition in your math classes. The application is provided by Utah State University. It will let the student select which platonic solid he or she wants. Then, the student can apply a colour and using the mouse, rotate the solid in 3D. He or she may change the size of it using a slider and can also change the way it appears using different "skins" including filled solid or wire frame solid. It is also possible to see it as a dual solid (one inside the other).